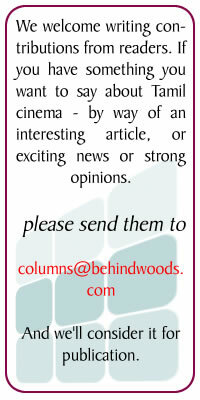 Ask any Tamil move fan this question – What are the realistic Tamil movies that have come out in recent years? You are likely to get identical answers from almost everyone and it will unfailingly consist of Raam, Paruthiveeran, Subramaniapuram, Nadodigal, Mynaa while there will be other movies that might alternate between the lists of different people. According to popular perception these days, the movies listed above are realistic (‘yathaartham’ in Tamil) and a good reflection of life in rural Tamil Nadu. Now, analyze the storylines of all the films listed above. Do they have anything in common – plenty! First, they are all away from the hustle and bustle of the city, they choose to depict rural life and (now comes bad part) they mostly have young men who aimlessly fritter away their lives, they never shave, cut their hair or do anything that will make them look even remotely civilized and (the worst part) all these films end on a tragic, morbid note with someone dying, getting killed, paralyzed, mutilated, jailed or any other sorry fate that one can think of. Most films listed above have another very important thing in common – they are very well scripted, shot, performed and are all commercial hits at the box office. And, that is (or already has) giving rise to a new dictum/dogma in Tamil cinema; ‘Realistic cinema should not have a happy/positive ending, especially if set in a village’. There seem to be a new breed of film makers faithfully sticking to this unwritten rule. Take for instance films like Goripaalayam or Renigunta which more or less adhere to this rule. It is beyond doubt that there has been a huge escalation in the number of village based themes since 2007 and nowadays all of them seem to carry an inevitably depressing finale (of course, there is the rare exception). We regularly cry out against formulaic commercial cinema which usually follows the ‘one man saves them all’ stereotype where the hero is the do-gooder (nallavar-vallavar, in local slang). But, there seems to be a parallel school of ‘formulaic realistic’ cinema that is developing which usually paints the protagonist(s) as a good for nothing philanderer, puts him in the hands of destiny, sends him into dangerous lanes and finally finishes him off with the sickle. In fact, the so called ‘realistic cinema’ might be getting even more formulaic than commercial cinema. The most worrying part here is that none of the film makers in question have made open claims of their films being realistic. They just want to make good cinema which will keep audiences glued to their seats in theaters and they are doing a wonderful job of it. All the labeling of realism usually comes from a section of the audience who are the opinion makers and the media. But, a huge portion of those who make such opinions and decisions are from the city who know next to nothing about village life. One cannot be very sure about how a genuine village dweller might feel about this stereotyped depiction of their lifestyles; we can believe that they will not at all be happy. But, they are neither opinion makers nor have a voice in the media. Very recently when Easan released, there were sections of the media which expressed a bit of displeasure at the stereotypical depiction of city-folk as people who cared very little about others. Now, if one film which chooses to generalize a dark element of a population can irk people into writing pieces in newspapers, then think of the effect of numerous such films on village folk. The same people who cried “REALISM” from rooftops when Subramaniapuram was released could not take Easan in the same sporting spirit because it pointed at them. Suddenly “REALISM” became “STEREOTYPING”. So much for consistency! We have come to a point where a happy ending is branded as ‘commercial’ while a morbid one automatically gets the ‘realistic’ status. There must be some kind of major negative mentality prevailing in us for this to happen. For all one knows most people still lead fairly happy and content lives. It has become compulsory for a director to introduce death, separation or punishment at the climax if he wants his film to be considered realistic. Happy endings are for the weak hearted; let’s get real, let’s get violent; seems to be the attitude generally, if the movie is set in a village. Of course, as said earlier, there are some exceptions; people who still believe that life can be good. There was Kalavani which showed that village life need not be all violent and bloody, though it did still have the ‘aimlessly wandering youngster group’. There is also Vennila Kabaddi Kuzhu which looked at villages from a fresh perspective, Nandhalala which steered away from a tragic end in spite of the script offering such possibilities etc. But, generally speaking, violence and wastefulness are norms of village based cinema. This is a time when students from rural areas constantly upstage their city counterparts in board examinations; when students from rehabilitation camps study their way into medical colleges. Our villages have long risen above senseless violence and wastefulness; our cinema sometimes refuses to let go. One cannot say that cinema which portrays the darker sides of village life should not be made; but, at least we can make an effort to not label them realistic, enjoy it just like any other movie. After watching Vaaranam Aayiram, many people said that it was highly unrealistic that a man would fly all the way to America just to find his love; agreed, it was a bit far fetched. But, the same people found nothing unrealistic when a guy stabbed his friend who had just been released from jail – Subramaniapuram. Are we confused?